Christmas is an amazing time! Smell of cinnamon in the air, smiling faces, glittering decorations, heart-warming Christmas songs, lots of candles, time to spend with your loved-ones baking and decoration cookies . We love Christmas and each time we are looking forward to it. That is why we love to celebrate the time before Christmas, anticipation – best do this with an advent calendar, bay bay day, 24 little pieces of Christmas. Win this hand made advent calendar with 24 chocolates. A truly Austrian product: the wool is from the Alps of Salzburg, the chocolate by Mirabell is made in Salzburg Grödig and the crochet was done in the city of Salzburg. 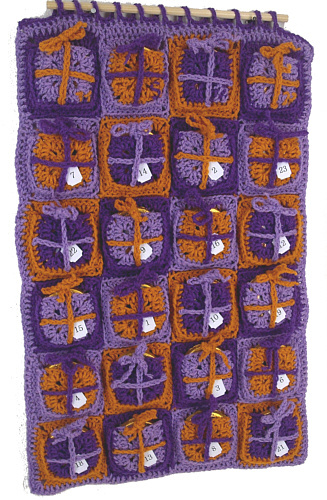 or you can chose to get a DIY-set of the advent calendar "Christine" choosing the wool colours you like. How to participate – lake with an advent calendar we offer many options for you. And if you take all of them you can not only double, triple but quadruple your chance to get this lovely Advent calendar. Post below this article a comment, about what you do especially like about Christmas. Become a fan of MiaDeRoca at facebook and tells us about your special Christmas spriti, what fills you with joy or maybe you want to post a picture of some Christmas bakery. Report on the MiaDeRoca sweepstake in your Blog and link to the MiaDeRoca shop or this give away page. Please help us to find your twitter or blog post by entering the link in a commentary (below). We are looking forward to hear about your special traditions and what makes your heart sing about this very special time of year – as you might know: shared joy is double the joy. please enter your e-mail address when commenting (it will not be shown publicly), we will contact facebook-fans via facebook. If you are already in the mood for a taste of Christmas go ahead and make some Glühwein (Austrian hot spicy wine) and lemon tasty angel wing biscuits.